Turmeric, also called Curcuma Longa or Kunyit, is recognized as an important food cooking ingredients and widely used in India, China, Australian, Sri Lanka, Egypt, Peru, and Thailand. There is an investigation about turmeric function not only is a cooking ingredient, but also can prevent human diseases such as cancer, cardiovascular and nervous system etc. There is an aromatic element turmerone that contribute to brain nerves growth and development so prevent senile dementia. Dried turmeric is more often sold all around world but price replies on curcuma quality which is drying result and moisture content. Drying or dehydration is a method of food preservation that has been used all over the world for centuries. Drying involves removing moisture from food; moisture is necessary for bacteria growth that eventually causes food spoilage and deterioration (Flores 2007). One of the primary drying methods is microwave vacuum drying and tunnel microwave drying machine. Traditional drying method takes a longer time and hardly control quality of products like hygiene and moisture content. Industrial microwave can dry a large scale of turmeric powder in a short time and rapidly remove unwanted moisture. Also, it will increase the qualities of turmeric powder including color, nutrients and texture. Meanwhile, microwave by emitting wave efficiently kill bacterial assure turmeric powder food safety. 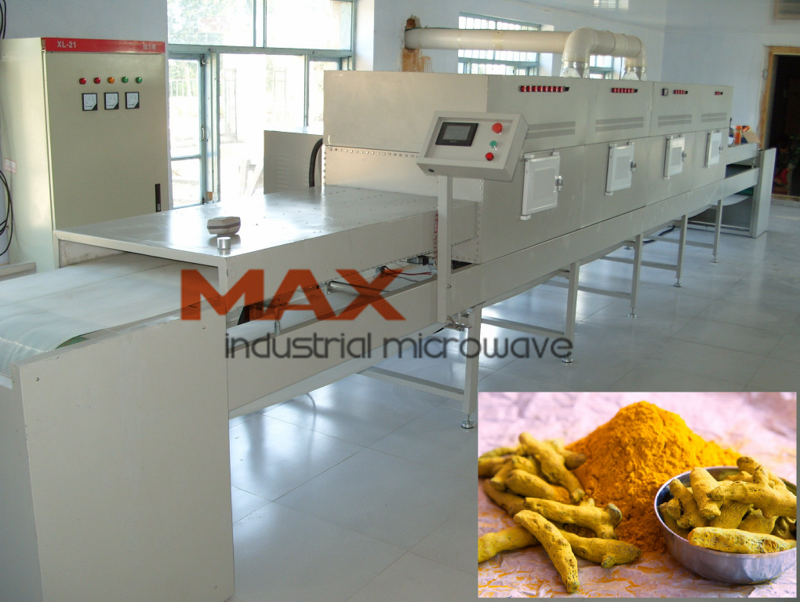 Small footprint, stable working performance and less energy consumption attract many customers to purchase MAX Industrial Microwave device to dry and sterilize the turmeric. MAX Industrial Microwave manufactures a variety capacity of machines that handles with different amount of turmeric material. For more drying and sterilization information, you can contact with MAX Industrial Microwave.